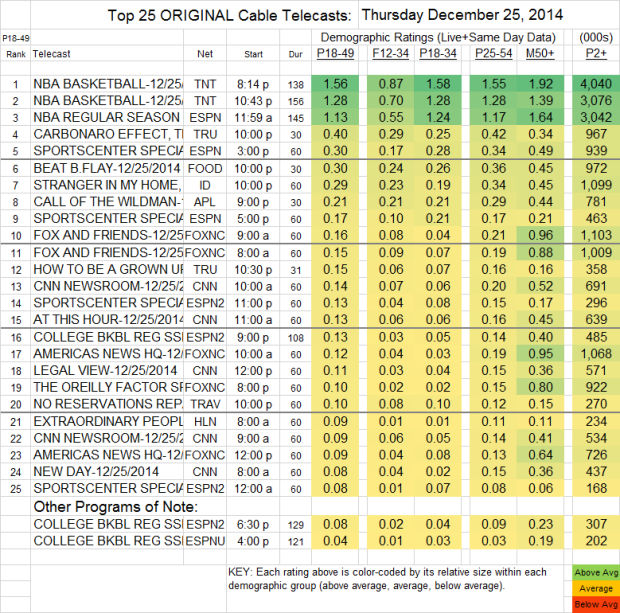 NETWORK UPDATE: The Christmas Night rerun of THE BIG BANG THEORY gained 0.1 in final numbers. Christmas cable was all about NBA BASKETB ALL on TNT and ESPN, with TNT’s primetime game at 1.56, the late-night game at 1.28 and ESPN’s noon game at 1.13. After that, it was a long way down to THE CARBONARO EFFECT (TRU), off 0.05 to 0.40, and with 0.15 for its lead-out HOW TO BE A GROWN-UP. In a sign of limited programming on other networks, 9 of the day’s Top 25 slots went to programming on CNN and FOX News.